1. To make the guacamole: mash the avocados in a medium bowl until slightly chunky. Add the onion, jalapenos, cilantro, lime juice, salt, cumin, pepper and cayenne, then mash the mixture some more. 2. Cover with plastic wrap directly on the surface of the guacamole to prevent oxidation. Refrigerate until chilled, about an hour. Just before serving, add the tomatoes to the guacamole and gently mix. 3. To make the cauliflower lentil taco ‘meat’: rinse and drain the lentils thoroughly. Add the lentils to a medium saucepan. Add the filtered water and bring to a boil. Reduce the heat to low and simmer until tender, about 30 minutes. Drain. 4. Pulse the cauliflower into rice-size pieces in a high-speed food processor. Heat the olive oil in a large skillet over medium heat. Cook the onion and jalapeno until the onion is translucent, about 5 to 7 minutes. Add the cauliflower rice, garlic, 2 teaspoons of the chili powder, 1 teaspoon of the ground cumin, and ½ teaspoon of the ground coriander, and cook for 4 minutes. Stir in the tomato sauce and cook another 3 to 4 minutes or until the cauliflower is tender. 5. Add the cooked lentils, the remaining 2 teaspoons of chili powder, 1 teaspoon of ground cumin, ½ teaspoon of ground coriander, and the salt and pepper. Cook for an additional 3 minutes. 6. 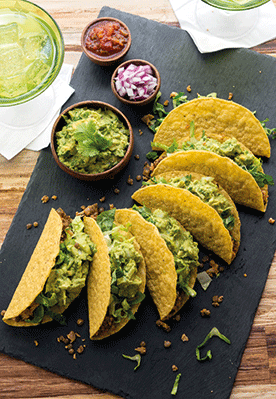 Scoop the cauliflower lentil taco ‘meat’ into the taco shells and top with shredded romaine lettuce and a dollop of guacamole. Serve immediately. With its hearty, chunky consistency, the cauliflower lentil taco ‘meat’ can also be served as a side dish with refried beans, guacamole, or salsa. Recipe courtesy of Eaternity: More than 150 deliciously easy, vegan recipes for a long, healthy, satisfied, joyful life, by Jason Wrobel, published by Hay House.